Today is the last day of March. I sure hope that we've met our Q1 2018 goals here at Friday Words. What's more, in one-on-one meetings, CEOs were reporting good vibes from Trump's effusive and artful flattery—and the sudden relief of not having to deal with what some knew to be relentless Clinton-team hondling (what can you do for us today and can we use your plan?). The book was famously rushed to print, and there were reports of some sloppy editing, so I initially read hondling as handling. That didn't entirely make sense, but I'd never heard the word hondling before, so it was the best I could come up with. But I eventually looked it up, and whaddya know. To hondle means to bargain or negotiate. It's yet another word in the lexical trove that we've gotten from Yiddish. (In this case, and as is true of many Yiddish words, it goes back to medieval German. The word Handel means "trade, traffic, commerce, business" in modern German.) I will note, tho, that hondle is a pretty rare word in English; it's missing in my normal go-to dictionaries (it is in the OED) and as far as I can tell, it doesn't appear even once in the COCA corpus. Perhaps Wolff will help popularize it. Let's move to word origins. One of my co-workers showed up today in shorts and a t-shirt; he'd just finished playing badminton. Badminton. Where do you suppose that word came from? Is there such a thing as goodminton? Haha. I had a hunch about that -ton ending, which was pretty much borne out. 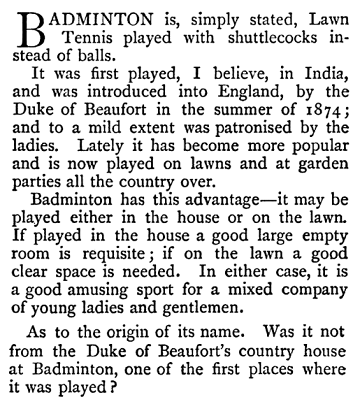 Sure enough, there's a place named Badminton in the UK. It shares that -ton ending with a lot of other places in the UK, like Northhampton, Boston, and Paddington. People generally agree that the game is named for the estate, but it's not 110% sure why. (First played there? Maybe.) It will do for now. Boy, spell-check hates the word hondle; it keeps trying to change it to handle.